Although Clint Eastwood is widely known as a movie star and film director, he made his career breakthrough on television. Born May 31, 1930 in San Francisco, California, Eastwood was not far from his 30th birthday when he was cast as Rowdy Yates in the hour-long CBS western series Rawhide. Filming for the series began in Arizona in the summer of 1958 and Rawhide aired on CBS until 1965. During those years, Eastwood's schedule was gruelling. He often worked 12-hour days, six days a week. Although the show failed to win a Emmy, it was highly acclaimed and popular with television audience for several years. Rawhide chronicled the adventures of cattlemen as they travelled across the United States. Eric Fleming played the role of Gil Favor, the trail boss and chief cattle drive organizer. Eastwood's Rowdy Yates was his right-hand-man and second-in-command of the operation. By late 1963, Rawhide's popularity was on the wane, but the show was not cancelled until the middle of the 1965-1966 television season. It's interesting to note that Clint was the only member of the cast to appear in all 217 episodes of the series. Clint Eastwood's television career began modestly in 1955 when he portrayed an orderly in a TV movie called Allen in Movieland. Allen in Movieland was a comedy/musical in which stars such as Steve Allen and Tony Curtis played themselves. In 1956, Eastwood was cast in some minor television roles. He was a quick-tempered army officer in a segment of ABC's Reader's Digest series called "Cochise, Greatest of the Apaches" and he played Joe Keeley, a motorcycle gang member on a Highway Patrol episode. Clint portrayed a cadet in a 1957 episode of the military anthology West Point called "White Fury." That same year, he took on the role of a suicidal gold prospector named John Lucas in "The Last Letter," a segment of the long-running western anthology, Death Valley Days. Eastwood made a brief appearance in yet another western series in 1957. 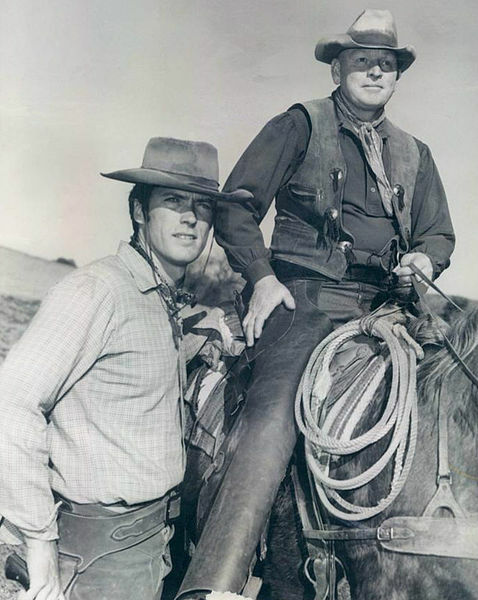 According to Patrick McGilligan in his unauthorized biography, Clint: The Life and Legend, Eastwood "can be spotted, fleetingly," in an episode of Wagon Train. In the filmography at the end of the book, McGilligan names the episode as "The Charles Avery Story." In 1958, Clint Eastwood played a Navy lieutenant in an episode of Navy Log, a military anthology that reenacted true incidents that had happened to U.S. Navy personnel. The segment was entitled "The Lonely Watch." In early 1959, Eastwood made a memorable guest appearance on Maverick, a western series with a humorous bent, starring James Garner. In the episode, Clint portrayed a cowardly and cold-blooded villain named Red Hardigan. Hardigan is determined to marry the daughter of Bret Maverick's (Garner) friend for her money. The episode, "Duel at Sundown" aired on February 1, 1959 (Season 2, Episode 19). During his Rawhide days, Clint Eastwood also appeared in an episode of Mr. Ed, the then-popular sitcom about a talking horse. The episode was entitled "Clint Eastwood Meets Mr. Ed" (Season 2, Episode 25). It aired on CBS on April 22, 1962. Eastwood portrayed himself in the episode, a change from his usual cowboy roles. The plot revolves around the problems Clint faces when he moves into Wilbur Post's (Mr. Ed's owner, play by Alan Young) neighbourhood. Mr. Ed sets up a party line with Clint's house, causing great frustration for Mr. Eastwood. To watch "Clint Eastwood Meets Mr. Ed," click on the links below. To listen to an interview with Alan Young about Clint Eastwood's appearance on Mr. Ed, click on the link below. Now at the age of 81, Clint Eastwood remains active in filmmaking, though his work is frequently behind the camera. He recently directed Leonardo Di Caprio in his role as FBI strongman J. Edgar Hoover in the film J. Edgar. Yet, without the success of Rawhide back in the late 1950s and early 1960s, his iconic film career may never have happened. It has just been announced that Clint Eastwood's family will star in a reality show called Mrs. Eastwood & Company. The show will air on E! and it will focus primarily on Clint's wife, Dina Eastwood, and two teenage daughters, Francesca, 18, and Morgan, 15. Francesca's birth mother is actress Frances Fisher, but she refers to Dina as "Mom." Clint will only make guest appearances on Mrs. Eastwood & Company. The series will showcase Dina's pet project. She manages an a cappella group called Overtone.